« Roland Mouret Hits Banana Republic 8/7! This entry was posted on Monday, August 11th, 2014 at 2:33 am	and is filed under Make Up, Nail Polish, Products, Seasonal Trends, Trends, Uncategorized. You can follow any responses to this entry through the RSS 2.0 feed. You can leave a response, or trackback from your own site. 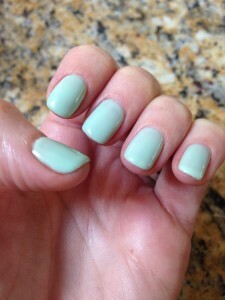 I bought this cute Aqua color last summer and enjoyed it on my toes often. I never thought it would migrate north to my fingers…that is until today. You never know. Thanks Nina. Can you share a picture or the brand + color? I’d love to check it out.